In California, Kate and I would from time to time buy strawberries from a roadside stand. The stand was located within the limits of Los Angeles County where nearly ten million people reside. We never found a stand selling corn or tomatoes but there were several next to strawberry fields. As we admired the baskets of strawberries we had just purchased, we could almost hear over our heads the melody of “Strawberry Fields Forever” and the question of how long would the growers of strawberries hold out. How long could the offers made by developers of new housing projects be resisted? Of course the real defenders of the strawberry fields in Los Angeles County, those who keep the fields flourishing and financially viable, are not the growers. 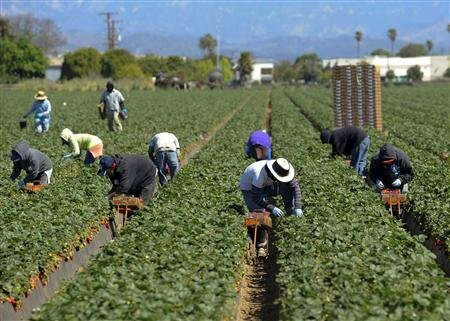 Those of us who buy the strawberries don’t ask the cashier if they are cultivated and picked by “legal” workers. We don’t ask if they earn the $8 minimum hourly wage in Los Angeles County. We breathe in the scent of fresh strawberries and are lifted by gratitude that the fields are still there. But we know that they wouldn’t be if the workers, the brown skinned men and women, earned a wage above the poverty level for a family. It’s the same in the fields seen on the drive along California’s U.S. 1 up the coast. How can those fields be farmed on some of the country’s most valuable real estate? If their workers have been at it for more than five years, don’t they deserve to be considered “legal”? Do we really want to continue to punish them through our immigration system?